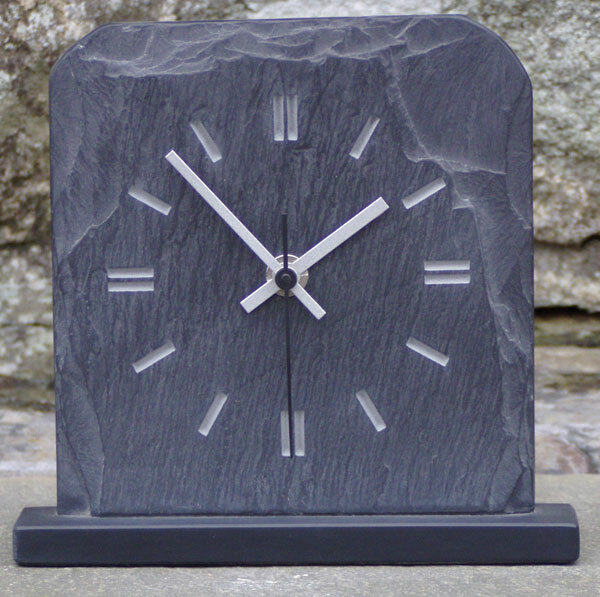 At the Slate Workshop we only use Welsh slate for our clocks and barometers. We aim to make timepieces and weather instruments to be proud of. See testimonials for some of our customers’ feedback. We make both wall hanging and mantel clocks and usually have a wide stock available. 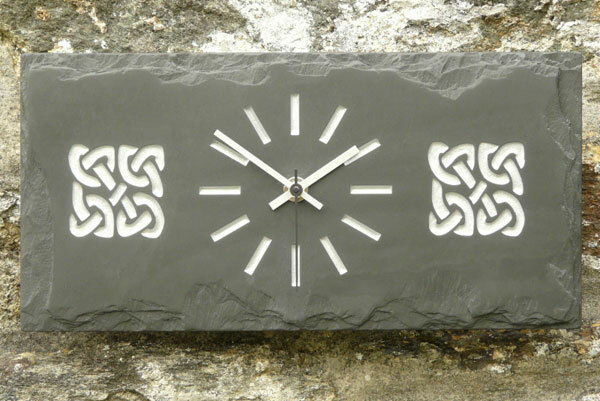 The clocks can be on either random ‘natural’outline or straight edged slate, or have curved or angled tops. We make engraved face clocks, both for sale in our showroom and to commission. We try and make original clock face designs as well as having classical designs available. We also insert clocks into the slate. The clock faces are in 3 sizes-(72mm, 80mm and 105mm diameter) so the slate is always considerable bigger than this. The clocks can have either white, gold or silver faces with Roman or Arabic numerals. Other sepcifications of colour and design also catered for. Both engraved face and insert clocks can have hand drawn and engraved artwork incorporated, and be finished with paint (usually silver or grey) or gold leaf. 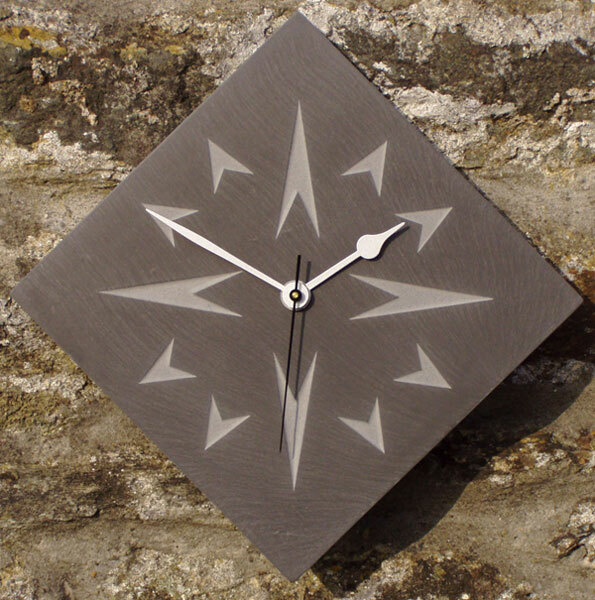 Slate barometers/thermometers/hygrometers are also inserted into the slate and can be either wall-hanging or free standing. Sometimes the inserted instrument is just a barometer, or a barometer and thermometer combination. Hygrometers- recording the relative humidity- are separate instruments inserted alongside or below the barometer. 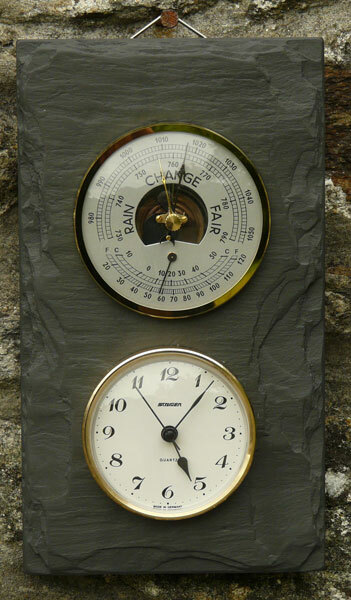 As with the slate clocks, the weather instruments can have hand drawn and engraved designs incorporated in the slate. We often put a clock with a barometer or barometer/thermometer. 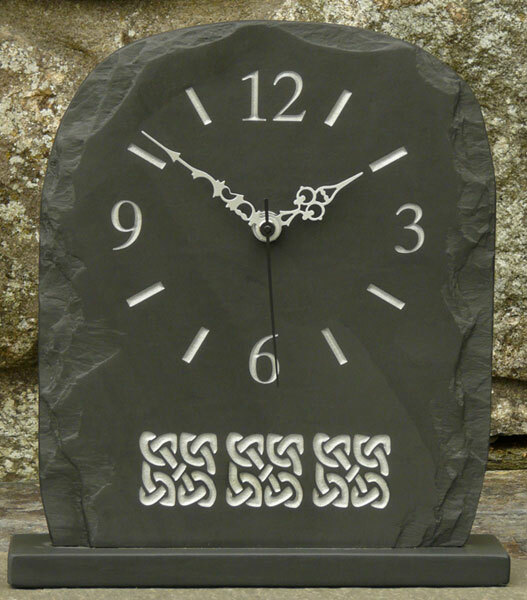 This makes an attractive and popular Welsh slate gift. Prices for slate clocks and barometers depend on size and additional artwork.